With reference to the proposed FAQ changes, I notice that more subjects have been added to the off topic section. As we know, many new users never read the FAQ, this is more than apparent by some of the questions we see every day. I'm sure the first time a new user is aware that they've asked an off topic question is when they see comments, down votes, or their question closed. 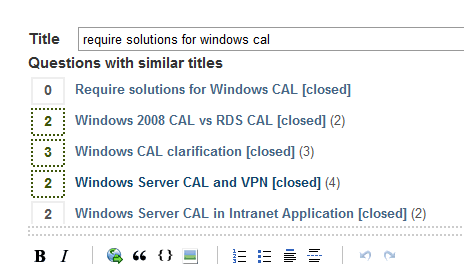 Out of curiosity, to test what a user would see, I've just started to form a question with the subject of 'Licensing my Windows Server', which as we all know, is off topic. Despite this, as you can see from the screenshot below, it might appear to a new user that this is an acceptable question, as only one similar question has been closed, the top result is definitely off topic and has an accepted answer. What they see re-enforces their thought that their question will be widely accepted. I just wanted to float a few ideas that might help reduce the number of off topic questions we get. If the title looks off topic, as well as showing similar questions, show a banner stating as much, with a link to the FAQ. Delete/blacklist tags that are off topic or stop these tags from auto completing when users enter their tags, as this will probably make the user think their question is acceptable. 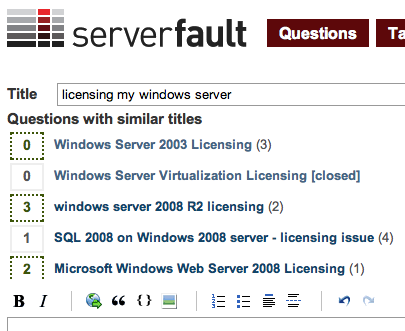 Keep these tags, allow them to be used, but when a user with a rep below a certain threshold tries to post a question with the tags, they receive a message about the question potentially being off topic, perhaps including an in-your-face excerpt from the FAQ, with an option to continue to post regardless, as in some cases the question could be considered on topic, yet use an predominantly off topic tag. If we could have a box pop up saying something like "HEY! It looks like you're writing a licensing question!" (perhaps with an animated assistant of some kind…) and tell potential users why we can't help that would be great -- I'm not sure it's programmatically feasible to determine if the title "looks off topic", but if there's a facility for substring matching we could probably use that. Certainly as @sysadmin1138 pointed out we should whack most (if not all) of these Licensing questions as dupes of the canonical licensing question.